Wow! Years ago, these sweet spuds knew they were a perfect mash for each other and decided to share their lives together. It’s time to celebrate 60 spudtacular years! How time fries when you’re having fun! Today they’re still two spuds in love and want you to join them in their mix and match celebration! Double your famous potato fun with the MASHLY IN LOVE set! 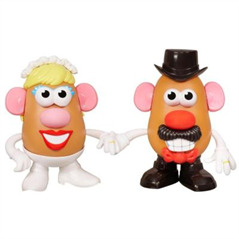 Get 2 spuds and all the funny parts you need to make the perfect potato couple, MR. & MRS. POTATO HEAD! Put MR. POTATO HEAD and MRS. POTATO HEAD together with their funny features and pants. You can have a wedding with MR. POTATO HEAD figure in his top hat and your MRS. POTATO HEAD figure in her headband. Then mix up their parts so you can’t tell which is which! Store their parts in each potato figure’s TATER TUSH™ compartment. 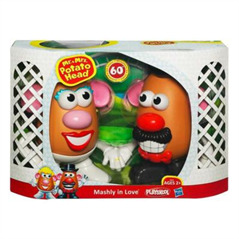 With these two lovestruck spuds, the potato-and-parts fun never ends! MR. POTATO HEAD body comes with arm with wedding band, 2 ears, mouth, pants with feet, top hat, eyes, nose, mustache and bow tie. MRS. POTATO HEAD body comes with 1 pair of arms holding hands, headband, lips with teeth, arm, nose, eyes, hair, 2 ears and pants with feet. We couldn't be happier for these happy spuds! 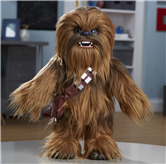 After all, we've all played with the Potato Heads since we were little nieces ourselves. Keep the family traditions growing!